After leaving my nails bare- with just the strengthener for a few days I was ready for one of the polishes I received in my swap from Mags- A polish I had seen in countless blogs and searched for dupes everywhere! Barry M Peach Melba. It's exactly how I pictured it to be- a perfect pastel peach! I adore it!! I'm soooo glad she included it! It really compliments my skin tone. I love it! While browsing Forever 21 last week for some tanks/tees to wear during the heat- I wandered over to their accessories section and saw an adorable plastic zip up travel bag with four bottles to fill up with lotions, shampoo/conditioner or face products! I had to pick it up! I sometimes have to work overnight and stay at my employers house- having to lug all my toiletries is a hassle. 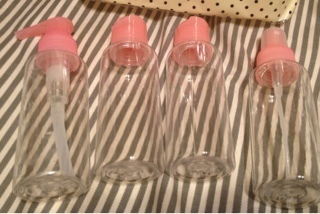 This is the perfect set up- 2 of the bottles have flip up caps, 1 has spray and the last one a pump! 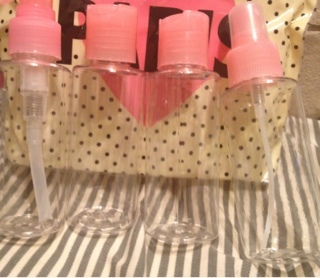 Each one can hold about 60 ml of products. 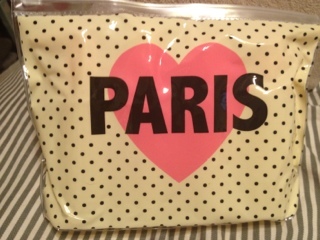 I love all things Parisian (despite not having been there- yet!) I had to grab it, it was only $3.80! They also had if available in black (with cream colored dots). I've yet to fill them up and actually use them but hopefully the quality is decent and sturdy! Has anyone else purchased any good deals lately? I love that nail polish and I love your skin color, Im sure all colors suit you amazing.. I'm between pale and yellow :( needing a tan ASAP!! Thanks Flo:) the sun had been brutal this summer- I apply SPF all day but my skin tans easily:/ no matter what I apply! The Peach Melba looks lovely on you! Thanks Emma!! I'm so happy I finally have it:) love Barry M!